Learn how the student loan decisions you make today impact your quality of life in the future. 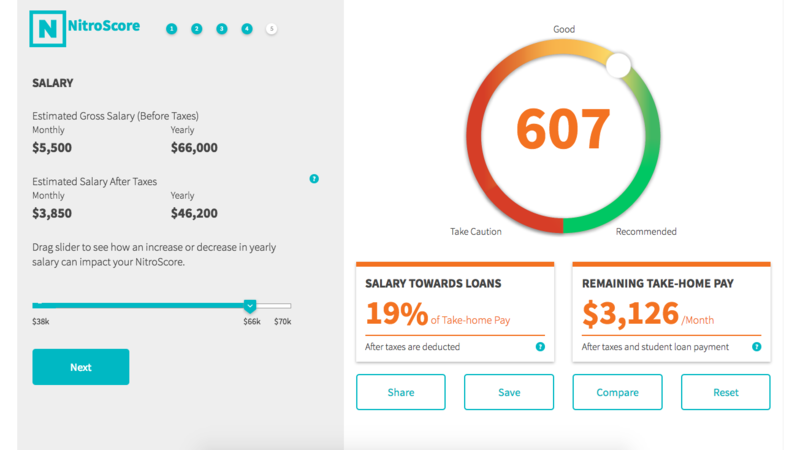 NitroScore, a free online tool, lets you rank your college and major choices - based on your predicted ability to repay student loans after graduation, so you can live out your dreams after graduation. Set yourself up for success by understanding how picking one college or major over another may impact your ability to repay student loans. What will your life be like after college? Will you land the job of your dreams and jumpstart your life? Or will you be forever saddled with college loan payments, unable to pay them back because you picked a high-cost college or a major that pays a lower salary? Are those pricey private schools worthwhile? Is the major of your dreams really a nightmare when it comes to earning a living? What schools offer the best value and ability to earn a living in the future? What schools and majors will allow you to pay back your college loans while still living a comfortable life? You owe it to yourself. Get your NitroScore today to assure a great future!